GM is not saying what the plan is if the Poletown Plant shuts down for good this June. If production at the GM Poletown Plant does shut down for good this June, what exactly will happen to the site? That’s a question city officials are seeking to find out. Recently, GM announced work will cease this year at five North American plants, including one in Canada. Hamtramck officials have a lot to be concerned about. The Detroit-Hamtramck Assembly Plant, commonly called the Poletown Plant, produces about $800,000 per year in lieu of property taxes to the city. That payment is also based on the amount of production at the plant. Without that revenue stream, the city will be hit with a major financial crisis. City officials, including Mayor Karen Majewski and City Manager Kathy Angerer, are in discussion with GM about the site’s future. Plans for the site, a small portion of which is located on the Hamtramck side of the Detroit border, are incomplete, and GM officials have not talked publicly with the media about what it would do with the closed plants. Majewski told The Review that GM has not talked about specifics about the site with her. “Even if the physical plant gets sold to another company — which I’m not at all sure GM is considering — I’d like to open a discussion about development of the green space and parking lots on the Hamtramck side,” Majewski said. The Review reached out to a GM representative for comment, but at press time no phone call was returned. This isn’t the first time a major auto-related plant has closed in Hamtramck. Several years ago, American Axle & Manufacturing abruptly announced it was ending production at their sprawling facility, which covered both sides of Holbrook near I-75. A good-sized portion of the plant was located in Hamtramck, and the company was one of the city’s largest taxpayers. Apparently as a way to reduce those taxes to a bare minimum, American Axle razed the Hamtramck side of the plant, as well as a good portion on the Detroit side. That was an old factory dating back at least to the 1950s, and was once owned by GM. It’s hard to say whether what happened in that instance is a guide to what will happen with the Poletown Plant. The fact that GM is shutting down the Poletown Plant raises another question. The creation of the plant back in the 1980s was extremely controversial because it required demolishing thousands of houses, churches and businesses that existed where the plant was going to be built. Many people were forced to sell their homes through legal action taken by the City of Detroit in a procedure known as eminent domain. GM got its plant, but at a high emotional cost to residents in the old Poletown neighborhood. The plant’s closing makes one wonder why the plant was built in the first place. Rather than demolishing the plant, why would GM not instead retool such a fairly new facility for vehicles the company wants to focus more on, such as electric and driverless vehicles? A partial explanation came from GM CEO Mary Barra, who recently told reporters that other GM plants are not running at maximum production levels. GM, analysts say, needs to consolidate its plants, and then invest its money in future markets. It’s not clear what other affected communities are going to do. But there is strong backlash from workers at the Oshawa Assembly Plant in Ontario. That plant is the community’s main employer, and its closing will be devastating. That triggered GM to issue a “cease and desist” warning to the workers to not post further advertisements attacking the company. 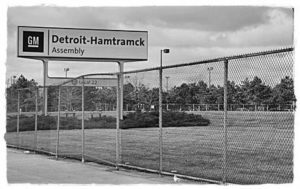 Neither American union auto workers nor Hamtramck officials have yet to publicly protest the closing of the Poletown Plant.